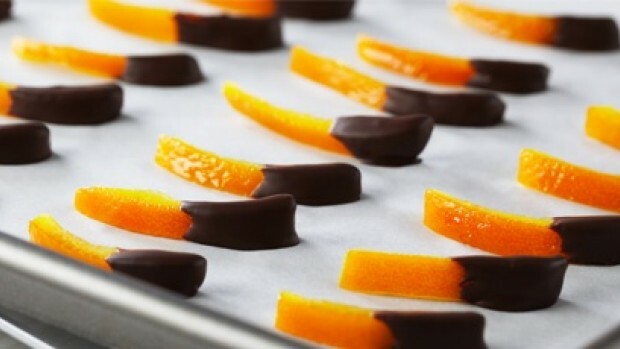 In episode Candied Orange Peel of TV show Bake with Anna Olson prepares Anna Olson recipe for Chocolate Dipped Orange Peel. Using a paring knife or orange peeler, score the peel of the orange without cutting through the fruit by making 2 circular scores at the top and bottom of each orange, and then making 4 or 5 scores connecting the top and bottom circles. Peel away the skin of the orange carefully, and then cut these into 1-inch strips. Bring a pot of water up to a boil and drop in the orange peel. Simmer the peel for 1 minutes, then strain, discarding the water. Refill the pot with 11 cups of fresh water and add the sugar. Bring this up to a simmer then add the orange peel and simmer gently, uncovered, for about 20 minutes ? the peel will look slightly translucent (but not completely). Remove the pot from the heat and cool the peel in the syrup to room temperature. Store the candied peel, refrigerated and in the syrup for up to a month. To dip the peel, first arrange slices of peel on a cooling rack over a baking tray to drain and dry for an hour. Melt the chocolate in a metal bowl placed over a pot or barely simmering water, stirring until smooth. 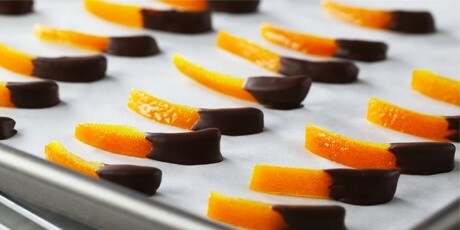 Dip each candied peel piece halfway into the chocolate and place on a parchment-lined baking tray until set. The chocolate dipped peel can be stored in an airtight container for up to 5 days.